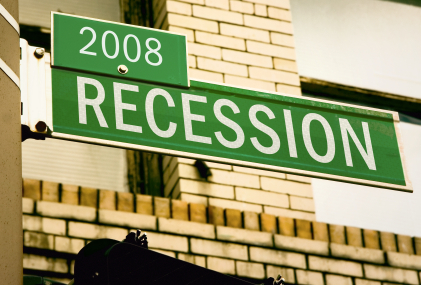 Recession is defined as a period of reduced economic activity, a business cycle contraction. A recession has many attributes that can occur simultaneously and can include declines in coincident measures of activity such as employment, investment, and corporate profits. A severe or prolonged recession is referred to as an economic depression. There will be reduced customer confidence and a reduce consumer spending. Businesses will reduce production levels as they find it difficult to sell their goods and services. In order to sustain growth, businesses will cut cost and will lay off employees. Economy will see an increased rate of retrenchment and more money is spent by the government on unemployment benefit. Government will get less revenue from income tax and VAT. Stock exchanges will see reduced activity. In order to boost economic growth, governments may resort to several strategies. These strategies for moving an economy out of a recession vary depending on which economic school the policymakers follow. Fiscal policy moves involve increase government spending to boost aggregate demand in the economy. Government may also reduce taxes. Tax cuts will promote business capital investment. Lower-bracket tax reductions are more effective and serve a double purpose including relieving the suffering caused by a recession. Monetary policy involves increased money supply and reducing the price of money i.e. interest rates. Reduced interest rates will promote capital investment and spark economic growth. Supply side policies involve giving subsidies and increasing the level of education of the work force. According to International Monetary Fund (IMF) global recessions are periods when global growth is less than 3%. The IMF estimates that global recessions seem to occur over a cycle lasting between 8 and 10 years. During what the IMF terms the past three global recessions of the last three decades, global per capita output growth was zero or negative. By this measure, three periods since 1985 qualify: 1990-1993, 1998 and 2001-2002.